Higher Power Doors will Save You Time and Money! The Higher Power hangar door has revolutionized the hydraulic door one panel system. No more hassels with straps, cables and hinges. We have a door that will fit your hangar opening like it was part of the origninal design. Our several thousand Higher Power Hangar Door customers won’t trust the security of their treasured aircraft building to anything else. 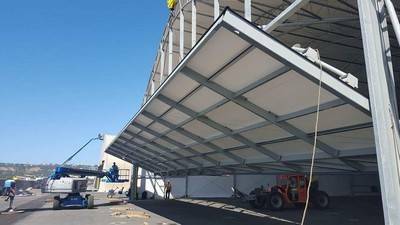 We'll custom manufacture your hangar door in any size as large as 50' tall and 180' wide. The innovative patented cam design increases your overall hangar door opening. This hangar door is the perfect alternative to any sliding, fabric, bifold, bottom roller doors and can be easily installed by your contractor. We also have Professional installation assistance available from Higher Power Hydraulic Doors® and is backed by a 6-year warranty. If you're the do it yourself kind of person you can enjoy the simple easy-to-follow installation instructions with full factory support and a 5 year warrenty. No special tools needed to bolt it all together. Once installed, this hangar door system is virtually maintenance free. We are the only manufacturer of the Higher Power Hydraulic Stand Alone Door in Benton Harbor, Michigan. The Higher Power Door is becoming the #1 selling hydraulic door system of all time! Now, hangar door construction is more affordable than ever. This self-supported hydraulic door does not rely on your building for its support. With only 6 1/2 inches of headroom loss there is no other door of its kind in the hangar door industry. We here at Higher Power Doors can build your door for any style of building, new or existing construction. Watch the video demonstration of our self supporting door and see for yourself how simple it is. Once you see the Higher Power Door in action you will agree that it is the most innovative hangar door on the market today. The Higher Power Hangar Doors are completely self-supporting. The door attaches to its own framing with no hinges to wear or repairs like other hangar doors. Unlike bi-fold or one-piece hydraulic doors, this design doesn’t impose vertical or horizontal loads on your structure either. The new patented cam mechanism design reduces head room requirements and system operating pressure. Cylinders mount inside the slide column. Gives your structure the side clearance and open vistas you want. No Hinges, No Headers, No Straps, No Cables, No Wheels, No Tracks! Take a flight to the Benton Harbor, Michigan (KBEH) airport to watch the hangar door perform live and we will meet you there and give you the full demonstration of this patented technology. Or, call us and we can find a door close to you and we will set up an appointment for you. Once you see it in action you won't trust the security of your equipment to anything else. For more information or an estimate: Call 1-269-927-8990 or email us at sales@hpdoors.com.